Pluto in Capricorn, 1776. Not far from where the Occupy Wall Street Movement was launched in 2011, protesters in 1776 responded to the Declaration of Independence by pulling down the statue of King George III. Painting by Johannes Adam Simon Oertel, c. 1859. The pressure continues to mount this week as Uranus forms another square to Pluto – this time, right as the former planet comes out of his annual five-month retrograde. This is a long-term aspect that will continue into 2015, so I don’t expect that we’re going to see sudden explosions and violence when the square is exact on Wednesday. Outer planetary cycles don’t work that way. Indeed, we’re already seeing possible manifestations, including the assault on the U.S. Consulate in Benghazi and the Chicago teacher’s strike. It’s worth noting that the Occupy movement is planning demonstrations on Wall Street this week to commemorate its first anniversary. Police already have made arrests, and it’s a safe bet that cops in riot gear – the quintessential image of Pluto in Capricorn – will be at the ready. As it so happens, Mercury in Libra opposes Uranus and squares Pluto on Thursday, which means that we’ll have a temporary cardinal T-square. You’ll remember the T-square from the summer of 2010, when it dominated the astrological charts. Mercury in Libra represents justice (at least in theory), balanced thinking, and diplomacy, but the Messenger is up against two warring heavyweights, and his voice is likely to be drowned out by inflammatory rhetoric. Put another way, the tension is too great to be eased by soothing words and promises. There’s something visceral going on with Uranus in Aries conflicting with Pluto in Capricorn. Repressed anger can’t be talked out, especially when it has been accumulating for centuries. The Sun enters Libra on Saturday, which is the fall equinox (spring in the Southern Hemisphere). Next week’s Full Moon will be in a close T-square with Uranus and Pluto. If there is to be any immediate fallout, I would expect it to happen within a few days of the Full Moon on September 29. Incidentally, this is a potentially challenging Full Moon for everyone. If you haven’t already done so, you may want to order your StarGuide Fall forecast. I’ve been getting a lot of orders for this report, so my turnaround time is now a week to ten days on new report orders. I’ve posted a notice on the order page indicating that I’ll give priority to Fall forecast orders, but there’s still a possibility that I won’t be able to get it to you before the September 22. Those of you who have ordered Starguide but still haven’t received it will get it before Friday. The only other aspect of note this week is a sextile from Venus in Leo to retrograde Jupiter in Gemini. This could be helpful for finances, depending on where these two fall in your chart. Romance may get a little spark, too, but I wouldn’t expect major developments unless either of these planets is in a sensitive position in your chart. Speaking of relationships, we’re in the final countdown of Saturn in Libra, which I wrote about in last week’s forecast. I didn’t mention, however, that as he approaches the first degree of Scorpio, Saturn forms an applying trine to Neptune in Pisces. These two have very different energies, but combined in a positive way can be a real tour-de-force. I expect we will have more “past-life” revelations, some of which may help us grow past the stuck places we’ve been and finally attain some peace of mind regarding difficult relationships. Compassion and sacrifice also play a role. Ask yourself what you’re willing to do for true love. This entry was posted in Forecasts and tagged cardinal T-square, mercury in libra, Sun in Libra, Uranus-Pluto square on September 16, 2012 by Pat. The biggest news this week is the equinox – fall in the Northern Hemisphere, spring for those of you in the Land of Oz and other parts south. The Sun enters Libra on Friday, followed by Mercury on Sunday, just as the Sun opposes Uranus. This is the halfway point of the astrological year, the balance between light and dark, represented by the scales. The scales, or balance, also are symbolic of the harvest, traditionally a time when crops were weighed and accounts settled. For our ancestors, it was the culmination of the agricultural year. If they didn’t plant enough, or if their crop was damaged by weather or pests, they had to do the math for how they would ration to get through the winter. For us, it’s a time to consider our progress since the Sun entered Aries on March 20. As you may recall, that was a particularly volatile period, with a new cardinal buildup that mirrored last summer’s T-square. Well, we get that again starting this week, as the Sun and Mercury form a T-square with Uranus and Pluto. That may sound dire, and yet I’m optimistic about the possible manifestations of this configuration, primarily because of the dynamic position of Mars. The testosterone planet has been frustrated in Cancer since the beginning of August. You only needed to drive a few miles down the highway to see it. I lost count of how many times some guy in a monster pickup screamed up behind me, rode my tail, then blew around me at twice the speed limit, cutting off the guy behind him. As of this evening (Sept. 18), Mars will be in Leo, where he is much happier. His energy can flow, and that means it can be channeled into creative projects and other productive activities. In this position, he’ll provide an “out” to the cardinal T-square, as he’ll be at a positive angle with Uranus in Aries, the sign he rules, and the Sun in Libra. At its best, this translates to creative solutions to seemingly insurmountable problems. It also shows where you can be a leader and a pioneer. The downside is that Mars will be at a jarring inconjunct with Pluto in Capricorn. Mars in Leo has megalomaniacal tendencies as it is. In discord with the ultimate authoritarian, we’ve got the metaphorical irresistible force colliding with an immovable object. Watch the news headlines for intransigent world leaders up against forces beyond their control (e.g., debt and finances). In your personal life, take care not to let your ego get the better of you in situations involving authority. This week is a great time to order your StarGuide 2011 Fall Forecast! I’ve added some new features, including expanded notes on Mercury retrograde and the lunations – two of which are eclipses. I’ve also added 1-2 pages with interpretations of the house positions of the outer planets. You won’t find these in a typical transit forecast, which provides this information only when a planet changes houses. With the outer planets, this can be anywhere from two years for Saturn to 15 years or more for Pluto. It takes me significantly longer to include this data, as I create these reports individually, but I’ve kept the price at $36. If you’d like to see a sample, I created a new one for one of my favorite Leo personalities, Martha Stewart. Next week’s New Moon is at 4 degrees Libra, which forms a tight T-square with Uranus and Pluto. I’ll cover it in next week’s forecast, but in the meantime, you can get an idea of how it will affect you by ordering your StarGuide Forecast. Remember, I’m going back to school on September 26, so if you wait, I can’t guarantee delivery of your report within 48 hours. Even if you order this week, it may take longer than 24 hours (my usual turnaround) to get your report, as my schedule is close to booked. This entry was posted in Forecasts and tagged cardinal T-square, celebrity astrology, equinox, Mars in Leo, Sun in Libra on September 18, 2011 by Pat. Sleeping Beauty, by Maxfield Parrish, 1912. The Sun’s entry into Libra this evening marks the fall equinox, when light and darkness are in perfect balance. In our high-tech society, we tend to take these cycles of nature for granted, but our ancestors were acutely aware of the disappearance and return of the light. Many of our best-loved myths, legends, and fairy tales grew out of this planetary phenomenon, although it may not be readily apparent. One that comes immediately to mind is the Descent of Inanna, who ventures into the underworld to visit her sister, a goddess deprived of sunlight who is depressed, miserable, and in constant pain. If you or anyone you love suffers from Seasonal Affective Disorder, you might well imagine how this myth came about. In fact, ancient Sumerian texts mention light deprivation and its affect on the libido. Pretty astonishing, don’t you think? Another tale that comes to mind is the Sleeping Beauty. There are many interpretations of the meaning of this tale. Some see sexual symbolism in the virgin who pricks her finger on a spindle and goes to sleep for 100 years. According to some traditions, the tale represents spirit “sleeping” inside of matter. That spirit, or love, is awakened by a kiss from the prince. In esoteric terms, spirit is light, matter is darkness, and the quest for reunifying them is eternal. For cultures where seasonal changes aren’t so extreme, the cycle of light and darkness is more easily seen in the phases of the Moon. As it so happens, this year we have both the equinox and the Full Moon with just a few hours of one another. As I mentioned in my weekly forecast, the Sun in Libra and Moon in Aries will retrace the degrees of the cardinal T-square, which peaked in August. This, too, will lead us to a better understanding of time and our place in the universe. Just some food for thought as we head into a new season. This entry was posted in Forecasts and tagged full moon in aries, Sun in Libra on September 22, 2010 by Pat. This year’s cardinal T-square is mostly done, thank goddess, but I’ve been keeping my eye on this week as one exception. Thanks to Thursday’s Full Moon, for a brief period, we’ll revisit the cardinal T-square, which peaked in early August. I wrote a complete interpretation in my Saturday post, reviewing how this Full Moon mirrors the T-square but also holds the potential to take us beyond the limitations we faced over the summer. In addition to the Full Moon, the big news this week is the Sun’s entry into Libra, marking the official beginning of fall in the Northern Hemisphere. The Sun will cross the degrees of the T-square, but one of the biggest obstacles in that earlier configuration, Saturn, has moved far enough away to be less of a constraint. Sun in Libra suggests moderation, so I don’t think we’ll get a power surge but rather the easy movement forward that occurs when you let your foot off the brake. The Sun’s Libra ingress occurs Wednesday at 11:09 p.m. on the East Coast of the United States. Of course, it will be Thursday already in the Eastern Hemisphere, where many of RealAstrologers’ faithful readers live. Before entering Libra, the Sun in the final degrees of Virgo opposes Jupiter and Uranus, both of which are retrograde and back in Pisces for the rest of the year. Although they aren’t part of the cardinal T-square, they do form a tight T-square with the Sun and Moon on Thursday, and so their energies can’t be discounted. Also, I expect that the Sun will carry some of their loud, boisterous energy forward into the Full Moon, so we can expect to hear from these two. Wild storms – meteorological, political and emotional – are among the potential manifestations from Tuesday through Friday. On Saturday, the Sun squares Pluto, newly direct in Capricorn and ready to flex his muscle. This is the most contentious aspect of the week and where I expect we’ll have to revisit old obstacles. There’s nothing to do during Pluto transits except to give up resistance. If you’re trying to hang onto something – a situation, a relationship, a belief – you may need to let it go. At the very least, you’ll need to change your approach. You probably already know where the problem area lies, as this really is just a repeat of issues you faced over the summer. This time, though, you may really need to give up and try something different. Difficult Sun-Pluto transits also correspond to mechanical breakdowns. If you’ve been avoiding repairs, you may not be able to do so any longer. Sunday could be emotionally charged, with the Moon in Taurus opposite Venus and Mars in Scorpio. It sounds great for certain indoor activities, but the resulting fireworks may be a little more intense than you bargained for. If you manage to access a deep place in your psyche where difficult emotions have been hidden or repressed, let them come up. The release may leave you feeling like a dishrag, but you’ll feel a lot better when Monday morning rolls around. Image: The new crop of apples has arrived! © Barbara Helgason for Dreamstime.com. This entry was posted in Forecasts and tagged cardinal T-square, equinox, full moon in aries, Jupiter in Pisces, Sun in Libra, Sun square Pluto, Uranus in Pisces on September 19, 2010 by Pat. This should be a fairly quiet week, and yet it won’t be without movement. Shifts continue to take place, but overall they’re less jarring. We still have just over a week left to Mercury retrograde, and while certain events may be happening without any effort on your part, don’t be too confident or too fast to embrace them. Changes are still likely, as well as delays and perhaps a change of heart by others. Or you may change your mind about something you thought was a done deal. And, of course, all the usual caveats still apply: no signing contracts, making major purchases, or starting important new projects. Stall, if you can, until the middle of next week. Venus, meanwhile, has entered discreet Virgo, not her favorite sign. From the tone of your comments, most of you have not been out partying all night for the past several weeks, and yet for one reason or another, you might need a reminder to treat your body right by increasing your exercise, eating more vegetables, and reducing your intake of fat, sugar, and toxic substances. I swear, I gained three pounds this weekend just by looking at a piece of chocolate cake. OK, so I didn’t just look. But who gains three pounds in a weekend? If you need help rebalancing your system, the Sun’s entry into Libra on Tuesday also will help. This is the equinox — fall in the Northern Hemisphere and spring in the southern half of the world — when the days and nights are of equal length. Libra is ruled by Venus, and we can use the Sun’s passage through Libra to find harmony and balance within ourselves. For many of us, planetary influences since last spring have pushed us past our limits and created a lot of stress. We need to regain our center. The Sun squares Pluto on Wednesday, which may provide us with yet another glimpse of what we might expect with the impending cardinal T-square between Saturn, Uranus, and Pluto. The Moon joins the pattern on Friday, when she conjoins Pluto in Capricorn. Keep your antennae up this weekend for anything that seems new or unusual. If you’re asked to stretch outside your comfort zone, try it. On Thursday, Mars conjoins Comet Lulin in Cancer. I admit that I don’t have a solid grasp of what this means, as we don’t know enough about Lulin yet. This mysterious visitor appears to be working on a subtle level, urging us to look back at where we’ve been before we can move forward. Moving backward through Cancer suggests looking back at our childhood and genetic roots for clues about what we need to know. 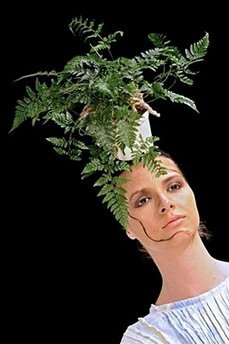 Image: This Venus doesn’t eat her vegetables but wears them on her head instead. Maybe she needs a lesson in hair styling from Leo? This creation was modeled at a fashion show by Colombian designer Laura Martinez earlier this year. Photo by Raul Arboleda for Agence France-Presse. This entry was posted in About astrology, Forecasts and tagged Sun in Libra, venus in virgo on September 21, 2009 by Pat.